Our range of chess sets combines the finest chess pieces and the highest quality boards to create perfectly matched sets. 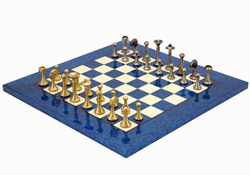 We create our chess sets by combining a set of pieces from one manufacturer, with a board from another. By doing this we create unique chess sets that are unavailable from any other retailer in the world. Where other chess retail websites often expect you to match up your own board and pieces we decided to do this for you to save you time and effort when choosing your chess set. It also has the additional benefit of being able to illustrate in the form of photographs exactly how the whole set will look once it's set up ready for play. 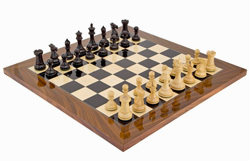 We stock a vast array of chess sets in a variety of styles, sizes and materials. We stock themed sets, wooden sets, glass sets, Staunton sets, small sets and large sets. All of our chess sets come from suppliers around the world and are distributed from our European warehouse. We ship worldwide and offer very competitive shipping rates to mainland Europe as well as everywhere else.